NATO design philosophy is meant to do what is meant to do, and does it perfectly fine. Apperently not, when most of it spawns overpriced inferior rube goldberg garbage like the Abrams, chieftain MBTs, stryker, and puma. Everyone already realized they are amphibious, because not everyone is a troll that thinks technological progress is linked to aircraft. The fact that you did not even see the podded propellers on the Boomerang is astounding. How the fck did you miss them? They looked more like exhaust pipes and I missed them. When I imagine a propeller I imagine a blade, not afterburner thingies. As for the kurganets, I thought they were ammo boxes. Abrams is the best tank in the world, bar none. Exhaust pipes? You do know the Bumerang has a front mounted engine. What do you mean by ammo boxes? I am talking about the things near the floor of the Kurganets, near the ramp/door. 2SPOOKY4U wrote: Abrams is the best tank in the world, bar none. Maybe 'one of the best', but most definitely not 'the best'. How is it not the best? Armor to Volume ratio is as low as America's tolerance for tyranny. Has 550 liters of JP8 to easily burst into flames in memory of those who froze at Valley Forge. The only good thing on the Abrams is the stuff that is not american...the american part (engine) is catastrophic and makes this tank one off the worst. Logistics outweight everything else and that is a hard military fact that everybody knows that has any even amateurish interest in military. Not much larger, plus a new paint job. 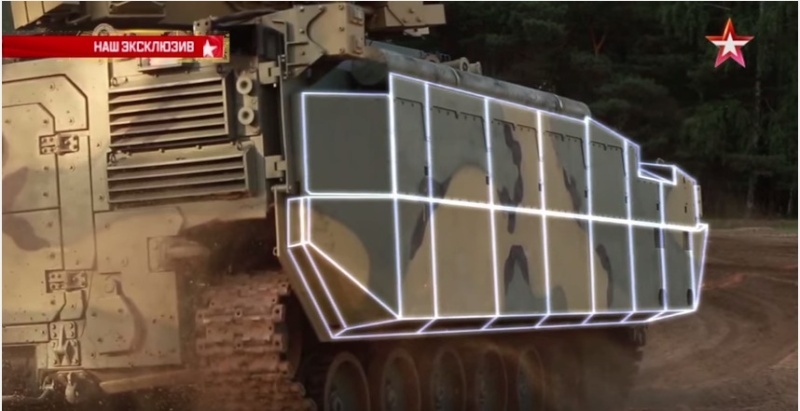 Russian defense industry has the technology to dramatically enhance the characteristics of domestic infantry fighting vehicles, armored personnel carriers, armored cars and BMD. So this summer, for the passage of military-technical forum "Army - 2015" in Moscow Kubinka OAO "NII Stali" presented its most advanced development. Let us consider some of them. For example, a ceramic plate to protect the light armored vehicles. Its structure consists of a protective flat SIC ceramics based on aluminum or steel substrate. This panel provides protection against small-caliber artillery shells with cores of heavy alloys caliber up to 30 mm. For the protection of armored vehicles developed by other panel consisting of roller ceramics based on corundum in the polymer matrix on the steel substrate or alyuminievoey. The level of protection to withstand armor-piercing bullets hit the B-32 caliber 14.5 mm. Aluminum armor layer PAS-2B is designed for the production of hulls of light armored vehicles. It consists of layers of aluminum alloys Different Strengths of ABT-101 and ABT-102. It provides gain in resistance compared with homogeneous and serial ply aluminum alloys 12-15%. Another interesting development is the foam aluminum. The exhibition was presented sample withstand the light armored undermining 6 kg of explosive. Aluminum foam is made of a new powder technology using high-strength aluminum alloy powder and titanium hydride (TIN2). Use of aluminum foam in the bottom of the structure results in reduced his weight to 300 kg. According to military experts, these developments will enable the domestic light armored vehicles not only effectively perform the tasks of the security of the state, but also to be competitive in the international arms market. Photo: "Bulletin of Mordovia", "Otvaga2004"
SiC? Who in Russia manufactures that? 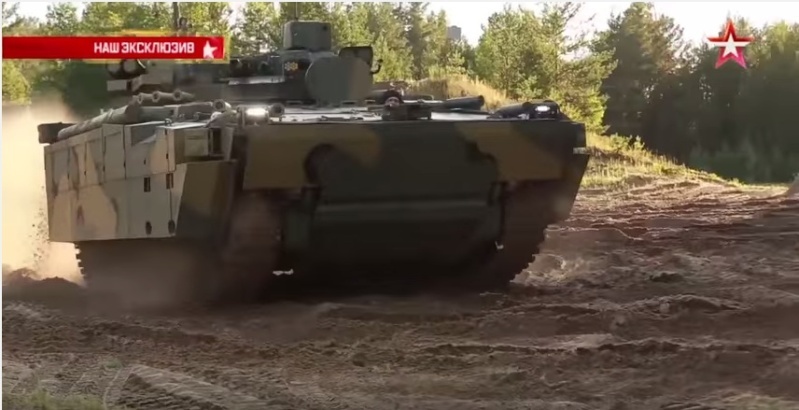 It would be an odd move for Kurga/Bumer to not use the Al2O3 and B4C of Typhoon, Armata, and BMD-4M (applique), all of the which are produced by NEVZ. 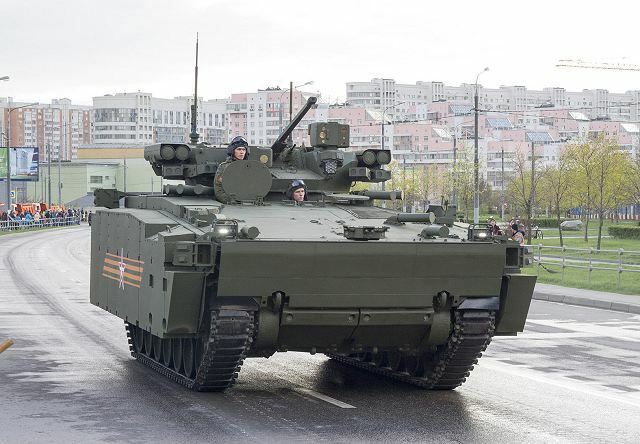 "On a unified medium tracked platform "kurganets-25" planned to create a mobile reconnaissance, chassis control machinery, machine radiation and chemical reconnaissance, as well as self-propelled artillery gun (120 mm)," - said the Agency interlocutor. Interesting, from what i am aware almost all armies around the world prefered to pick wheeled platforms for NBC recon. I assume Russians want do build one on tracked so they can follow tanks? They plan to have everything wheeled and everything tracked. There will be armata divisions where every vehicle is armata based (so all heavy and all tracked). There will also be Kurganets divisions where every vehicle is Kurganets based (so all medium weight and all tracked). There will also be Boomerang divisions where every vehicle is Boomerang based (so all medium weight and all wheeled). There will also be Typhoon divisions where every vehicle will be Typhoon based (so all light weight and all wheeled). When theh said it was going to be top of the line, they werent kidding. sepheronx wrote: When theh said it was going to be top of the line, they werent kidding. Cutting edge tends to be expensive, however the costs should definitely drop over time, plus the platforms are modular in every sense of the word, meaning that their lifespans while in service will be several times longer than non-modular armor platforms, in which you save a ton of money later on. They also have high parts commonality, which means that you could save money by sharing parts and spares, as well as saving money by buying a smaller variety of complex machine tools for the factories they're being built in, as well as training less people with a less variety of complex machinist and mechanical engineering duties. Thats the great thing about this chasis. Pretty much universal and used for Kurganets and Armata. Future? Artillery and such. It will be used for so many functions, it will become quite cheap. Maybe cheaper than equipment now. But that is the future and glad Russians are looking at the future (this and pak fa as examples). looks like there some changes in the shape of the side armor. 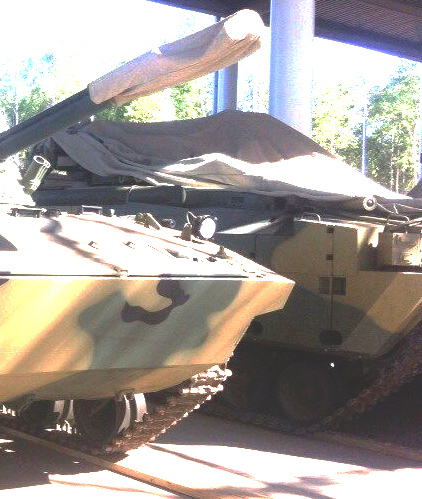 The Kurga at Victory Day was using a modified version of the NERA on BMP-3M. It wouldn't surprise me if they improve or replace it. Nice find, i didnt expect them to show its interior so soon. Hmm, interesting tho, that camera feeding video into gunner FCS looks like its some "of the shelf" civilian solution, maybe video is not of the best quality here tho so its tricking me. The video is of crappy quality. From what I can tell, the picture on that display looks very good, though it is just a day-optic. Yeah i agree, video is quite poor, i hope HD version will soon be on youtube as other Poligon shows. Video itself looks good, however i am not sure about device used to take video, somehow looks its civilian grade tho imaging is clearly in HD resolution.